Windows 10 is the standard operating system for all PCs at UiT The Arctic University of Norway. #1: Windows 10, what's new? Check out this Quick start guide for an overview of important buttons and functions. Find and start programs installed on your computer from the start menu. 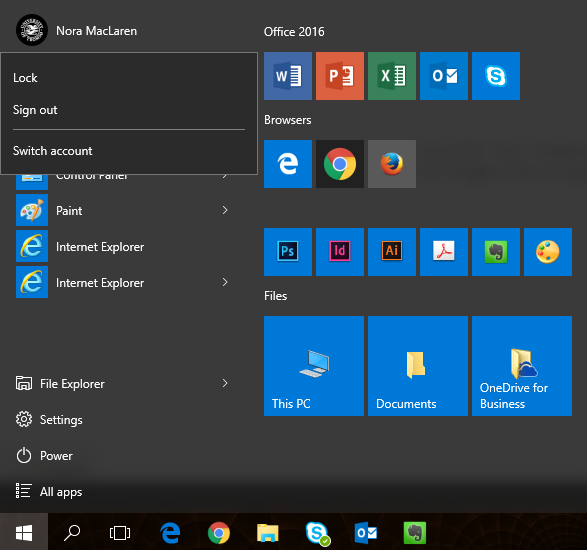 To open the start menu, click the Windows button (1) in the bottom left-hand corner of your screen. 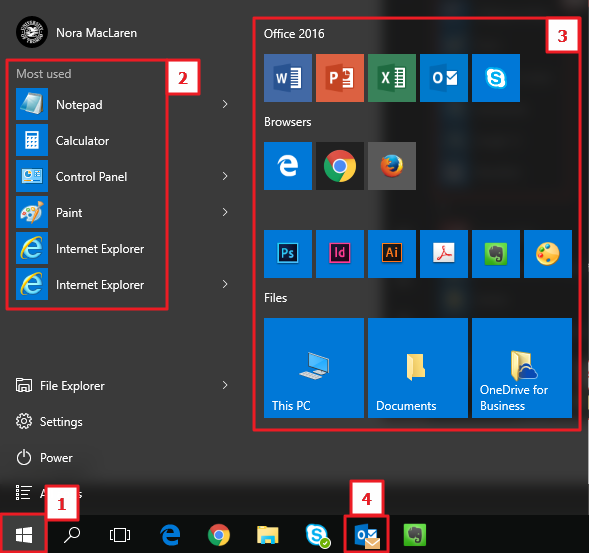 This is where you find all the programs you have recently installed, programs you use frequently (2), an alphabetic list of all the programs installed on your computer, and programs you have pinned to the start menu (3). 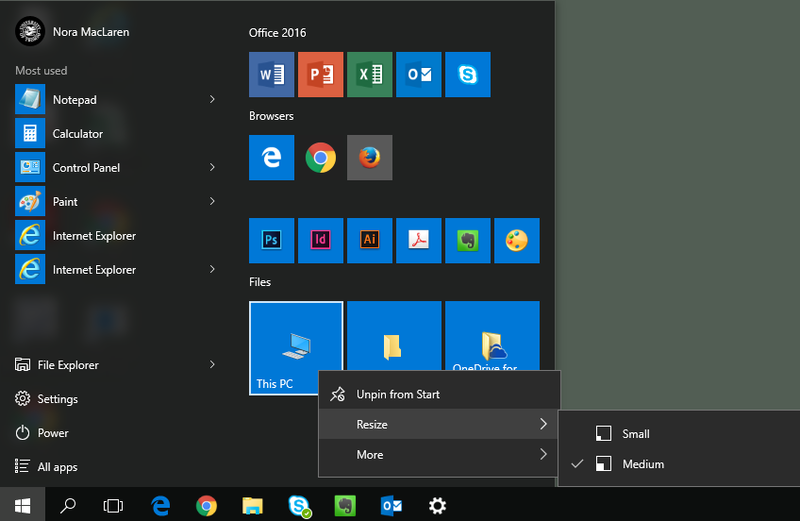 You can change the size of the start menu. You can also pin programs to the task bar (4). Internet Explorer is the default web browser on UiT PCs. You can open Internet Explorer from the task bar. Links you click on in your email, for example, will open in Internet Explorer. Edge is Windows 10's new web browser. Being a web browser, Edge can be used to read web pages and save bookmarks, but it also lets you annotate web pages with your own notes. 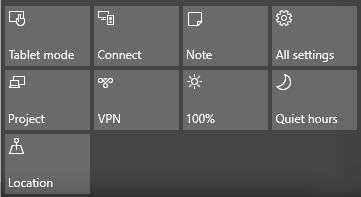 You can open Edge from the start menu. If a web page doesn't work in Edge, try a different web browser. Chrome and Mozilla Firefox can be downloaded from Software Center. Internet Explorer is included in Windows 10. 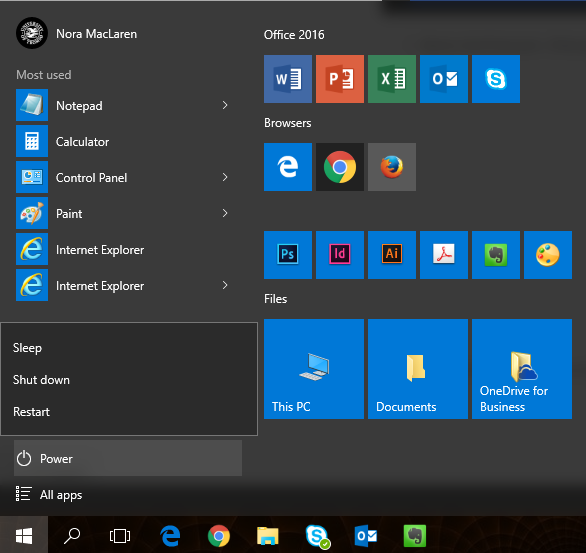 You can open Internet Explorer from the start menu, the task bar, or directly from Edge. Open a web page in Edge. Click on the "More" button (three dots) in the upper right-hand corner of Edge. Choose "Open with Internet Explorer". The web page you were viewing in Edge will open in Internet Explorer. 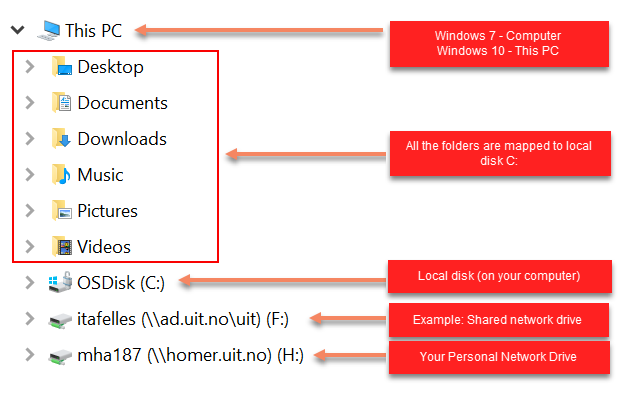 The file explorer is how you navigate your computer when looking for files that are stored locally or on UiT's personal and shared drives. 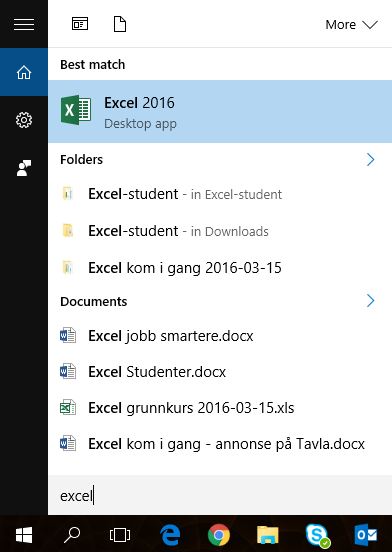 To open the file explorer, click on its icon in the task bar or start menu: . You can also click the Windows button + E on your keyboard. On the left hand side of the file explorer you'll find Quick Access. You can bookmark frequently used folders in Quick Access. Note that "My Computer" is now called "This PC". Navigate to your UiT personal drive and the desired folder. Note that there are also options for saving files in Microsoft's cloud services like OneDrive and Sharepoint. If you are not well acquainted with these services, don't use them. Saving files from other programs is the same as it was in Windows 7. Connect to your UIT personal drive. Follow the process described in the previous section. Not finding what you're looking for? 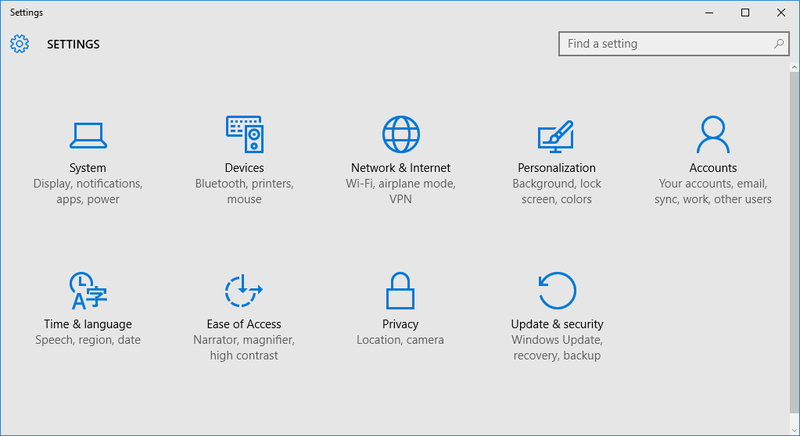 Use the search bar to find programs on your computer and files stored in your Microsoft cloud storage accounts. The search bar is located in the task bar (the magnifying glass). You can also press the Windows key on your keyboard and start typing the name of the program or file you're looking for. You can filter the search by using the buttons in the results box. Use the file explorer (Windows key + E on your keyboard) to search for files and folders. Type the name of what you're looking for (1). The search results are shown in a separate column (2). 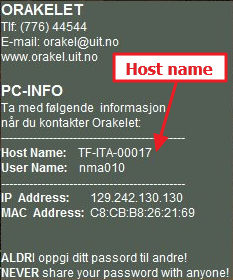 On your desktop you will find a black box with information about how to contact Orakelet and the name of your computer (host name). If you have to contact Orakelet concering a problem with your computer, make sure to send them the host name too. In meeting rooms and lecture halls, the black box will also include a useful link: uit.no/avhjelp. This webpage is a sort of first aid when you are trying to present, connect to a video conference, and more. There are several ways to find the options for logging out, putting your comptuer to sleep, restarting your computer, or turning it off. Open the start menu. Afterwards click Power. Right-click the Windows button in the bottom left-hand corner of the screen. Press CTRL + ALT + Delete on your keyboard. To log out, you can also open the start menu and click the UiT logo/your name. Windows 10 lets you organize programs on virtual desktops. For example, you could have a virtual desktop for all the programs you use in your research project and a separate virtual desktop where you prepare for lectures. Click on Task View and then New Desktop. Start working on the newly created desktop. Swap between desktops by clicking Task View or using the keyboard shortcut Ctrl + Windows + arrow left/arrow right. To organize windows within a desktop, click the top of the program window and drag it to the top or side of your screen ("snap assist"). 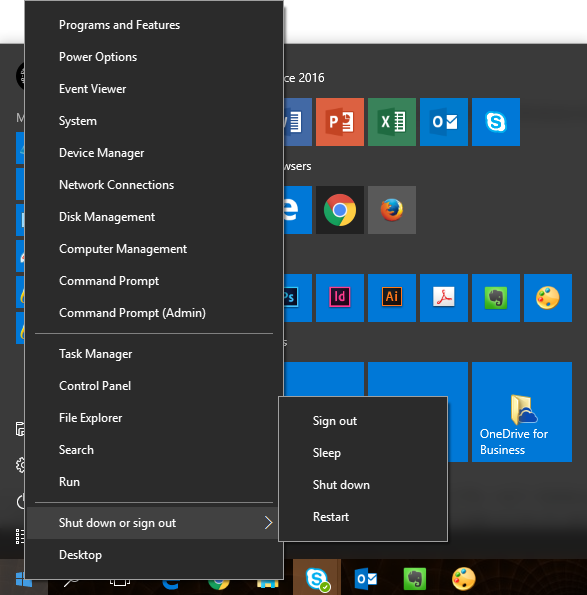 Personalize the start menu to make it easier to find programs, apps and folders you use frequently. 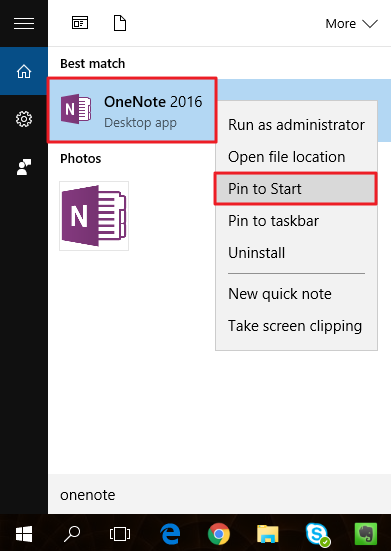 To create a shortcut to a program in the start menu, open the start menu, find the desired progam, right click on the program, and choose "Pin to Start". 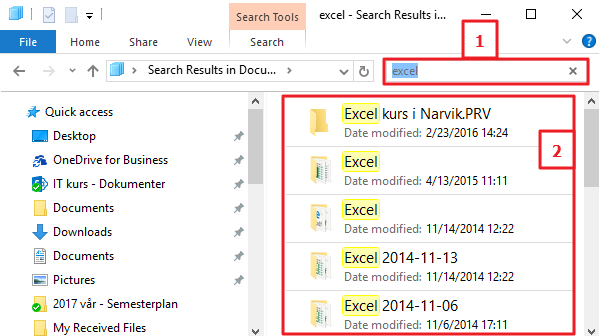 Follow a similar process in the file explorer if you want to make a shortcut to a folder. 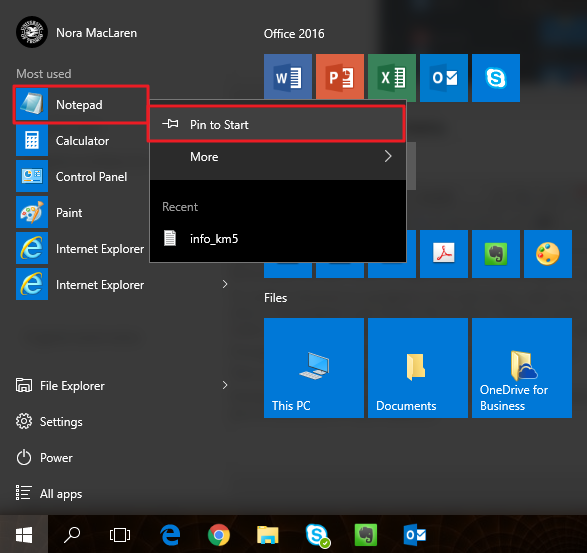 "Pin to Start" creates a tile in the right-hand side of the start menu. Change the size of a tile by right-clicking and choosing "Resize". Tiles can be sorted into groups by using drag and drop. Certain programs/apps are "live tiles". For example, if you create a tile for the News app the tile will show you a live preview of news headlines. Open the notification center by clicking the notification center button in the bottom right-hand corner of your screen. All settings. See the section of this page about settings. Tablet mode. Do you have a laptop with a touch screen? Switch Windows over to tablet mode. Connect. Connect to the Internet; for example Eduroam when you are on campus. Open Settings by clicking on the Windows button and then on the cog wheel. You can also open Settings from the notification center. This is where you find the options for setting screen brightness, desktop background, and time and date. The control panel is a more advanced version of Settings. 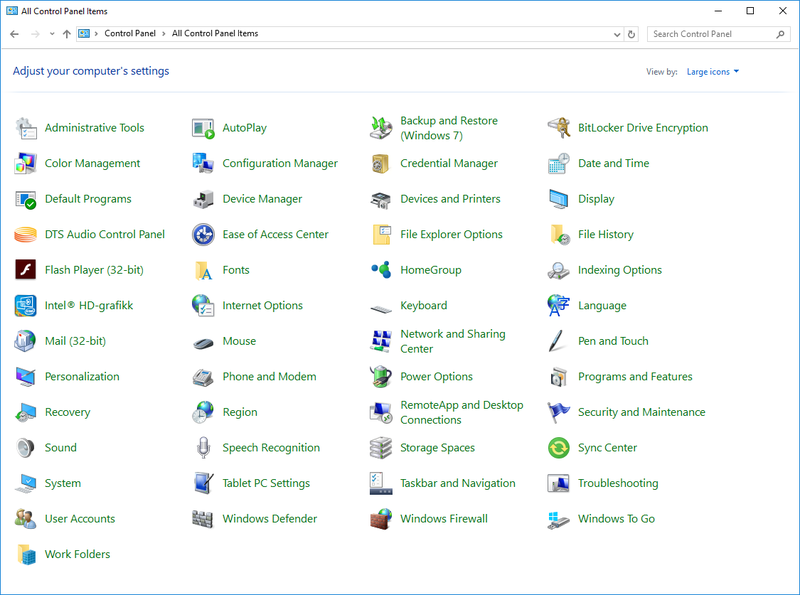 Open the control panel by right-clicking on the Windows button and choosing Control Panel. Note that the search bar in the upper right-hand corner lets you search among all the available settings in the control panel. Bookmarks are stored locally on your computer and when you swtich to using a laptop as your main UiT computer you will need to export and then import these. How to guides for each web browser are below. When you switch from using a stationary PC to a laptop it is important that you learn where you should store your files. When you log in to the computer with your UiT username and password you have access to several different storage locations. The image below shows what your Windows file explorerer can look like on a laptop. Make sure you save files to UiTs network drives. H: This is your personal network drive at UiT (also called the home drive). This is where you will normally save your files. You are the only one who has access to these files. These files are regularly backed up and the storage location is secure. Shortcuts in red box (Desktop, Documents, etc) point to the local disk. You should NOT store files here. If there is a problem with your computer, you risk losing these files. C: Local disk. You should NOT store files here. If there is a problem with your computer, you risk losing these files. F: You might have access to one or more shared network drives. When you are given access to a shared drive you will also be informed what should be stored here. Shared network drives are secure storage locations. 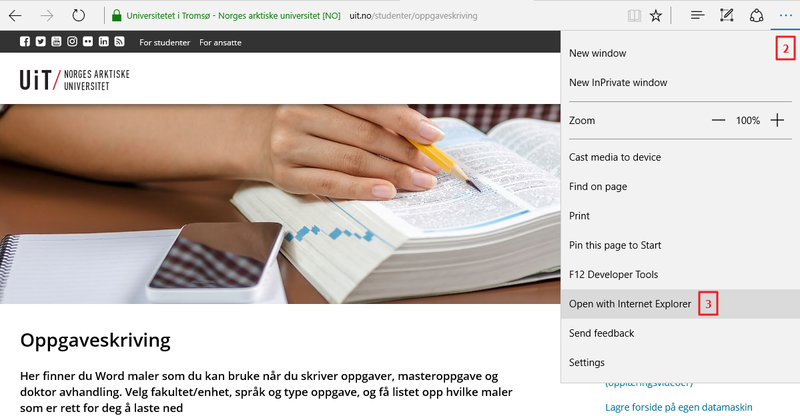 Learn how to connect to the H drive when you are not connected to UiT's network by cable or using Eduroam.